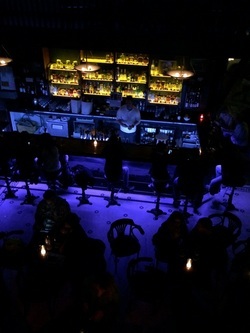 The new bar at The Royale. Photo courtesy of Jon Vargas. 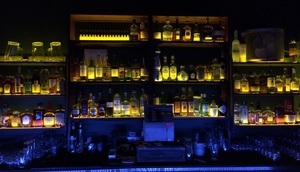 The back bar at The Royale, ready for ya. Photo: Jon Vargas. After landing a full liquor license and then closing for renovations, Cafe Royale has reopened, although it’s now known simply as ~THE ROYALE~. The partners installed a new wood bar and backbar, repainted, and best of all, the upstairs mezzanine has some new lighting, booths, and tables, making it an ideal spot if you’re on a date. The Royale wants to continue its legacy as an easygoing neighborhood bar, and is offering some fun beer-and-a-shot combos for $9-$10, like the “Steam and a Beam” (shot of Jim Beam and a pint of Anchor Steam) and the “Fern-Berger” (shot of Fernet Branca and a mug of Radeberger). The Royale will keep offering its fun programming, from the Drunken Spelling Bee to free jazz on the weekends to Monday Happy Hour Comedy on second Mondays—keep up with it all on Facebook. Another thing they are noted for is their monthly rotation of art—February’s art show will be featuring original pinup drawings from Alberto Vargas! Hawt. The grand reopening party will be Saturday February 1st, FYI. Hours are Sun-Wed 4pm-12am, Thu-Sat 4pm-2am. 800 Post. St. at Leavenworth, 415-441-4099. It looks like Dogpatch is getting yet another newly refreshed watering hole, this time from Chris Lawrence and Brad LaMotte of Southern Pacific Brewing, who are taking over Hogan’s Goat Tavern. Eater reports that the project will offer a selection of beers on tap, traditional cocktails, and a low-key, neighbor-friendly atmosphere. They aren’t planning a lot of construction: apparently, they’d like to be back open by baseball season in the spring. 2289 3rd St. at 20th St. 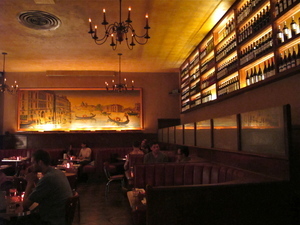 The backlit wall of wine at Tosca Café. Photo: © tablehopper.com. This Wednesday January 15th, head to ~TOSCA CAFÉ~ for a chance to meet Italian winemaker Riccardo Campinoti from Le Ragnaie in Montalcino. He’ll be there, pouring tastes and glasses of his wines, which include three Brunellos, as well as a Rosso di Montalcino and a Chianti. Ceri Smith, one of Tosca’s wine directors, says that this is an excellent opportunity to meet a winemaker she considers one to watch. 242 Columbus Ave. at Broadway, 415-986-9651. You love the wines of Copain? Mmmmhmmm. Well hop on over here to check out the winemaker dinner happening at ~SPRUCE~ on Monday February 3rd. $125, exclusive of tax and gratuity. Starting Tuesday January 28th, ~BERGERAC~ in SoMa will be offering a retro happy hour from 5pm-7pm every Tue-Sat. You’ll find $6 retro cocktails, draft beer for $4, house wine for $6 a glass, and $2 snacks like grilled cheese and tater tots. Oh, and if you get a group together, check out the “Boogie Nights Punch Bowl”, which serves five to seven people for $20. You can all put your keys in it when you’re done and start your next party. Heh. 316 11th St. at Folsom, 415-255-9440. 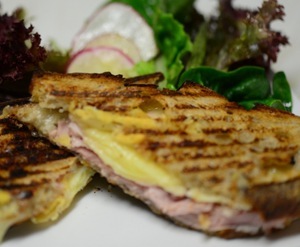 The Croque Monsieur from 2212 Wine Bar, as photographed by Martha Stewart. Photo courtesy 2212 Wine Bar. There’s a new wine bar in Uptown Oakland, in the former Punchdown space: ~2212 WINE BAR~, from owners Sam Patel and Paul Fitzpatrick. The wine list is focused on affordability (most glasses are less than $10) and allowing people to compare wines through flights. There is also a selection of local beers, including offerings from Sudwerk and North Coast Brewing Co.; take a look at the wine list and beer choices here. There is a French bistro-inspired menu of small plates, including a croque-monsieur, smoked salmon, and of course charcuterie and cheese; here’s the menu. Every evening, check out the “reverse happy hour” from 9:30pm-10pm, when select glasses of wine will be discounted. There will also be guest chefs, starting with David Vardy (previously chef-owner of O’Chame) on Thursday February 6th. Hours are Mon-Sat 5pm-10pm, with lunch hours coming soon. 2212 Broadway at West Grand, Oakland. A reader wrote in to let us know that ~CLUB PARLIAMENT~ is now open in Old Oakland. The new club and bar is open late, and offers cocktails, late night hours on weekends, and themed nights. The space can also be used for events. Hours are Mon-Thu 4pm-8pm, Fri 4pm-1:45am, and Sat 9pm-1:45am. 811 Washington St. at 8th, 510-251-9911.